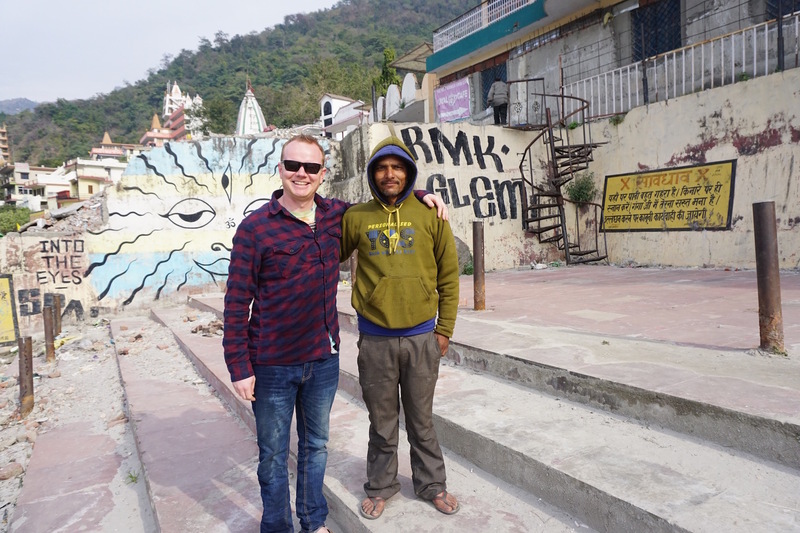 Its January 15th and we have been in Rishikesh one week. Rishikesh is a meat-free and alcohol-free city located in northern India, nestled in the foothills of the Himalayas along the Ganges River. The river is considered holy (known by the locals as The Ganga), and the city is known as “the birth place of yoga”, and is filled with places to study and practice yoga. There are many temples and ashrams (centres for spiritual studies), and the city attracts hippies, backpackers and people seeking personal and spiritual growth from all over the world. Britt is 6 days into her month long Yoga Teacher Training Course at Vinyasa Yoga School (she will post an update on that soon). Our time has been spent exploring most of the area around Laxman Juhla, a large suspension bridge crossing the Ganges. We have yet to venture downstream to the further reaches of town. 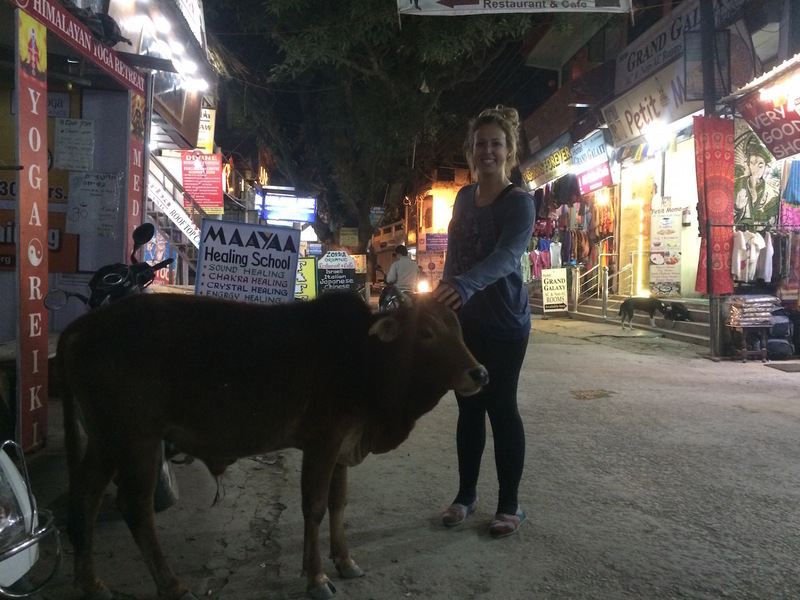 During the day, the streets are filled with scooters, cows, and folks eating, shopping, taking classes, and taking in the sights. Here are some pictures of our favourite things to do here. Nutella and Banana Crepes at Devraj Cafe, a popular spot! The coffee was very strong but we hadn’t drank one for a while so it still hit the spot. Protein Packed vegan pancakes and green tea at Delmar Cafe aka 60’s Cafe, a tribute joint to the Beatles. Indian Breakfast at Cafe De Goa, great view of the bridge. The Indian style pickles that come with this dish are so strong but delicious. A look down the street, close to Hotel Qube where we are staying. One of many vendors selling colourful bags and fabrics. Fruit stand and a cow peeking down from above. You can buy whole fruits or have them pressed into juice right before your eyes. We’ve been leery of the Lime Soda Stand, as refreshing as they look we don’t know if they use safe water. The Butter Cookies we have tried, and they are awesome! Shiva is the most popular Momo spot in our area. Tons of options for street food here. Everyone seems to be eating it but we heard it can make you sick…the odd meal out is totally worth the risk! So far so good. Monkeys are all over Rishikesh, especially around the bridge. 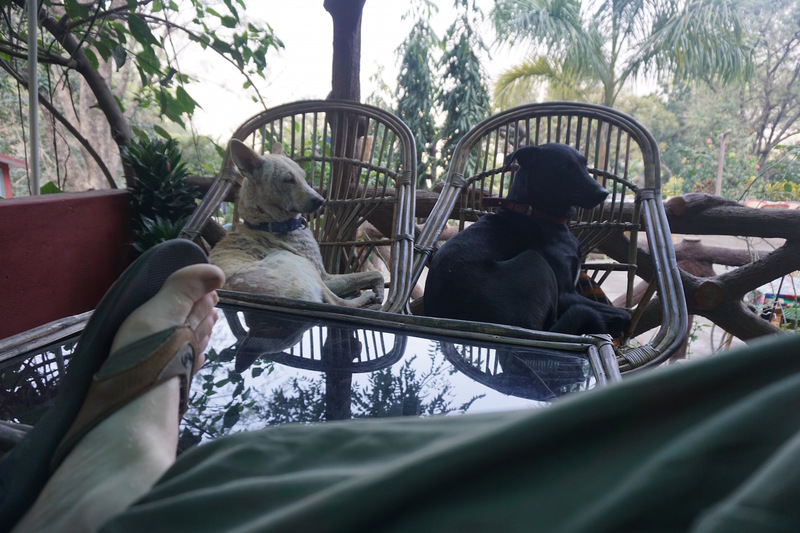 They are cute but they will steal your food and are known to get aggressive, don’t make eye contact! These larger black faced ones seem to be the most aggressive. We were sitting in a cafe when one jumped in the window and stole food right off someones plate! Classes and retreats literally everywhere. Britt after her welcome ceremony at Vinyasa Yoga School. Some locals and tourists going for a dip in the holy waters. Jeff getting his feet wet in the Ganga with a young lad who is hustling flowers for Buddha. This is a list of our favourite things to do, thus far. We have only been here a week, and we still have about four weeks to go, there is much more to do here. Do the locals eat from the street vendors or is mostly tourists? I see they have english on signs do most of the locals speak english? How much would a square meter of material cost from one of the shops there? Sorry all the questions lol. Awesome pics stay safe !!! What a great adventure for you and Jeff. Enjoy yourself and make many memories. Love the pictures and the write-ups. Be careful and be safe. What an inspiration your are to others. Thanks so much Mrs. Chatten! When im reading this, im in india with you guys! Keep it comin! Loving seeing all your updates!! What a experience!! Be safe and enjoy! !